Do I need a grease trap at all? Virtually all commercial and some domestic kitchens will benefit from installing an efficient grease trap. It will prevent the blockage of the kitchen drains which is caused almost daily in some kitchens by grease, fat and cooking oils cooling and sticking to the drain pipe walls. Once the grease has been separated and trapped, there is time for it to be treated or alternatively, collected and removed. New local authority regulations stipulate the grease traps must be fitted to all catering establishments. Those kitchens which have literally no space for a grease trap either inside or outside, below ground should install a liquid dosing pump to inject biofluid into the drain pipes every night after the kitchen has closed. This will create a biomass culture inside the pipes but is a more expensive option long-term. Should a grease trap be installed? If oil or grease is used in an establishment it will get washed into the sewage system therefore a grease trap should be installed. Large amounts of oil or grease in the waste water causes trouble in the collection system pipes and the wastewater treatment plant. It decreases pipe capacity and results in pipe systems needing to be cleaned more often or even replaced sooner than expected. Problems caused by wastes from restaurants and other grease producing establishments have served as the basis for regulations governing the discharge of grease materials into the sewer system. Consequently the installation of grease traps and grease treatment facilities are usually recommended and is now compulsory under local authority regulations. What if a grease trap is not installed? If an establishment uses oil or grease in food preparation and does not have a grease trap there is a high risk of an eventual drainage maintenance problem because of a blocked building sewer line. This blockage can create sewer back up problems and ultimately a health hazard in the establishment. If the blockage is in the establishment itself, the owner will have to pay for clearing it. If the problem is in the main public sewer system and it can be traced to the establishment, the owner could be held responsible for the maintenance requirements of the public sewer. A grease trap, combined with managed maintenance is an assurance that adequate precautions are in place to prevent blockages in either case. As fats, oils and grease from your cooking cools, it hardens and congeals. It sticks to the inside of your drainage pipes, restricting the water flow and gradually blocking the drain. Using detergents or bleach may appear to help but it is only temporary as the mixture soon reverts back to thick or solid fat, forming a blockage further down the pipe. By installing an ECS Biomass Grease Trap close to your sink, you will be collecting and treating the grease before it has a chance to block your drains. 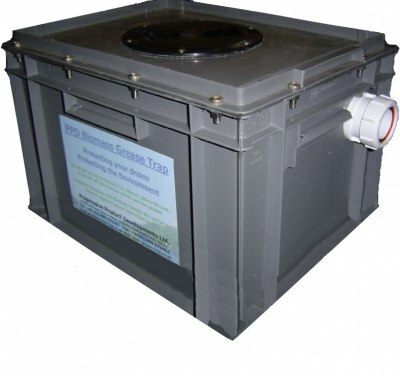 Each ECS Biomass Grease Trap is primarily an efficient separator – the fats, grease and oil stay trapped on the surface and water is allowed to pass from the bottom of the trap, up through a dip-pipe out to the drain. Model DS10DGT is for up to 10 meals per day in an up to 4 person household with 1 domestic-size sink and 1 dishwasher connected. Model DS20DGT is for up to 20 meals per day in an up to 8 person household with up to 2 domestic-size sinks and 1 dishwasher connected. System A: Manual BioFluid Dosing – a 1 litre bottle of Concentrated BioFluid with a hand pump on top – 2 squirts every night in the sink as the kitchen closes. System B: Automatic BioFluid dosing – a 240 volt or battery operated automatic dosing pump delivers a small amount of BioFluid from a separate container into the grease trap at 2 a.m. Every morning. It is worthwhile noting that there are more than 12 bacteria strains used, all naturally occurring, harmless strains, chosen specifically for their ability to break down different types of fats and oils. They are also particularly beneficial to Septic tanks, sewage treatment plants and land-drain systems.